Creating your route to work or further study. 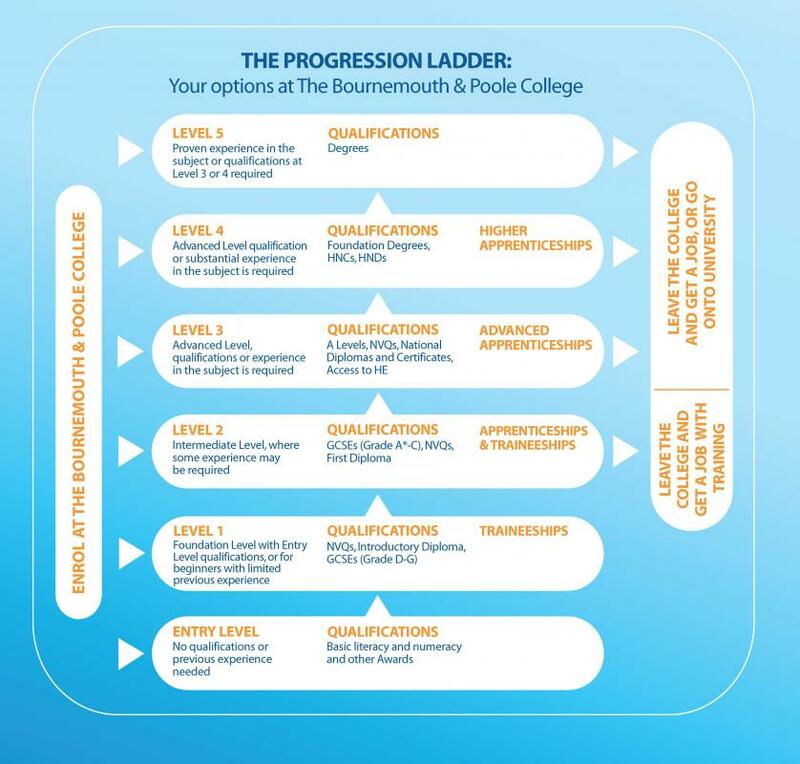 Find out more about the types of courses available at The College and how you can progress up the qualification ladder. Preparing you for a successful and sustainable career is central to our work at The Bournemouth & Poole College. Our ‘progression ladder’ is designed to ensure you understand all of the opportunities open to you at every stage of your education. We provide the opportunity for you to develop the knowledge and skills you need to get a job or progress into further/higher education including maths and English qualifications. Courses are generally 600 hours of study over a year. How these hours are spread out depends on the course. You could be doing 16 hours a week, for 36 weeks, over 3 days a week. Or you might do 5 days a week for 20 weeks, with work experience for the remainder. Courses can last for as little as one day or as long as two years. Part-Time courses are particularly suitable for adults looking to return to education or wanting to develop their work skills and knowledge. Apprenticeships and Higher Apprenticeships combine on-the-job training with study. They're a great way to get practical workplace experience and nationally recognised qualifications. Even better, you earn as you learn. Access to HE Diplomas can offer a quick route into Higher Education courses for adult learners who haven’t been in education for a while. They offer a credible alternative to A Levels with an emphasis on building the confidence and skills students need to get back into academic study. Typically for students who have completed their A Levels but increasingly also for adults who are looking to gain new qualifications, Higher Education study enables people to complete a Foundation Degree, Higher National Certificate (HNC), or Higher National Diploma (HND). Post GCSE studies that are mostly theoretical and conducted primarily in a classroom based environment. The courses focus on studying single subjects. The courses are particularly suited to those looking to continue their studies perhaps at university. A professional and technical course prepares students for jobs in specific trades and crafts, perhaps a position in engineering, hairdressing, bricklaying, accountancy or as a chef. It focuses on a particular career path and can lead to higher level qualifications or directly into a job.